Opinion: Political will, policy change and scientific evidence: whither international agricultural R&D? In this first opinion piece for our e-Newsletter series to highlight opinions and analysis by thought leaders on global agriculture and food and nutrition security, we have Dr Colin Chartres, new CEO of the Crawford Fund, emphasising the need for a more multidisciplinary approach to how international agricultural R&D is delivered and scaled out. As individual scientists, we thrive on understanding more and more about less and less and, in many cases, once a study has been published in a peer reviewed journal, we start the same process over again of defining a problem, hypothesis testing and data analysis. It is indisputable that this process has delivered excellent improvements in plant and animal traits, models that describe reality and often, the desperately needed increases in productivity that have helped feed a growing global population. However, many argue, correctly in my view, that these gains have been at a high cost to the environment in terms of habitat reduction, soil degradation and contamination and water resources over-abstraction and quality decline. These concerns lead to the key question of how can we promote sustainable intensification of agriculture that will enable us to produce the 50-70% more food required to feed over 9 billion people by 2050? My experience in the Water Commission in Australia and at the International Water Management Institute suggests that we need a more holistic and multidisciplinary approach to agricultural R&D, with greater emphasis as well on the key enablers of the uptake of scientific results. 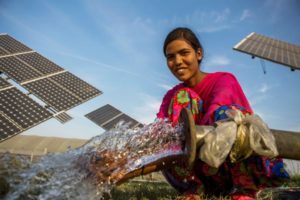 Recently, I have been contributing at the Australian National University to the policy development component of a larger study (funded by The Department of Foreign Affairs and ACIAR) looking at the water-energy-food nexus and sustainable intensification on the Eastern Gangetic Plains in India, Bangladesh and Nepal. The three countries making up the Eastern Gangetic Plains in South Asia are experiencing rapid growth in population, economic wealth and urbanisation. At the same time, the majority of the population remains engaged in agriculture subject to climatic, water, and energy stresses. The key findings of our work demonstrate that the major impediments to increasing agricultural output and farmer prosperity in the EGP are not simply the lack of access to new technologies, but rather the lack of an enabling environment from a policy, institutional and financial perspective and mechanisms that facilitate the scaling out of innovative technologies. Without political leadership that has to embrace social, economic, gender and land reform issues, and without the development of private sector driven supply chains, no matter how promising the outputs of physical research, real change for the better for the poor farmers involved is likely to be very limited. Elsewhere in India there is an outstanding example of how policy led change transformed rural Gujarat and other states. This is the Jyotigram Yojana program driven by the current Prime Minister, Narendra Modi when he was Governor of Gujarat, which has seen village electricity supplies separated from electricity feeds to irrigation pumps. Power to the pumps can then be cut for proscribed periods, reducing overdraft of groundwater, greenhouse gas emissions and ensuring more reliable electricity for villages, without significant decline in agricultural output. In Australia, we have also seen significant changes to land and water management driven by political leadership and policy actions including the Landcare movement and the water reform process that culminated in the Murray Darling Basin Plan. Whilst some outcomes of such policies are not welcomed by all, the point is that a combination of policy, incentives and in some cases legislation, often drives on-ground change relatively quickly to achieve specified goals. My conclusion from these examples is that if we want to drive change in agricultural practices to improve smallholder profitability, yield growth and environmental sustainability, theories of change need to proactively consider the role political goodwill and policy may have in delivering widespread outcomes. Similarly, R&D generally needs to be multidisciplinary in nature and cast within an understanding of larger scale biophysical functioning of not only landscape or river basin, but also the economic and social systems in which the agriculture is nested. This is essential to us to conceptualise and understand the wide spectrum of issues involved in sustainable intensification. There will of course be exceptions to these “rules” but as researchers we need to move away from our silos and reductionist tendencies and look at the biophysical, social and economic systems in which our work is cast. This will allow all drivers of behaviour, including policies and incentives, as well as scientific evidence to be identified and clarified as a matter of routine at the birth of any project.